File Expenses facilitates expense management quickly and easily in any currency. File Expenses revolves around the users within an account profile: Submitters, Approvers, Administrators. 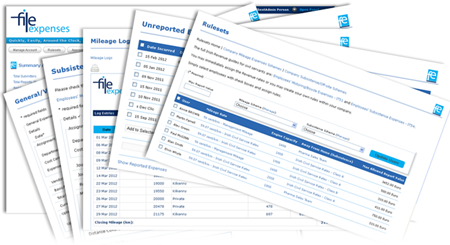 In each case, users have access to extensive reporting and analytics. File Expenses provide access to our systems on two account levels: Personal Account and Business Account. Our business accounts are built for scale and complexity and deliver expense management quickly and easily. Track all your expenses with receipts and allocate according to your needs. Invoice your clients directly from our systems and include both billable time and associated expenses with receipts if necessary. Whatever your size, whatever currency you use and wherever your employees go, File Expenses gives you and them the Expense Management tools your business expects. File Expenses provide access to our systems on three user levels: Submitter, Approver and Administrator. All are linked on our systems with reminders and updates issued automatically by email when input is required. 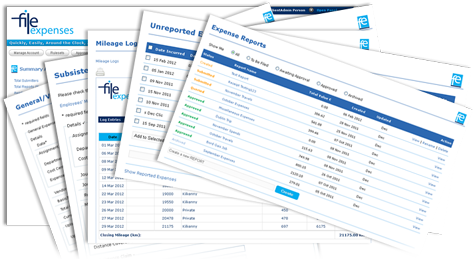 File Expenses provides access to extensive reporting tools through an analytics dashboard. How do our accounts differ and what does it cost? Simply sign up for one of our account levels. If you want a taste of what we offer, the personal account level provides FREE access to some of our features. Just email address required (no credit card).